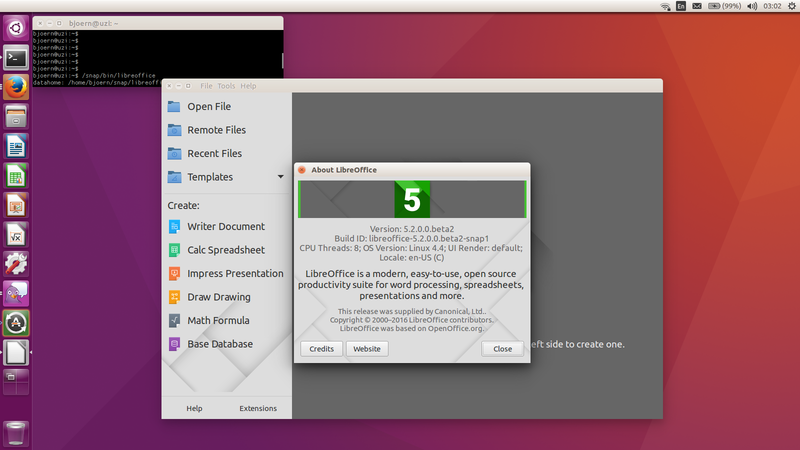 LibreOffice 5.2.0 beta2 as a snap package – You can't take the sky from me. This is one of the things that snap packages will make a lot easier: upgrading or downgrading versions of an application, having multiple installed in parallel and much more. Watch out as there are more exciting news about this coming up! Update: As this has been asked a few times: Yes, snap packages are available on Ubuntu. No, snap packages are not only available on Ubuntu. This text has more details. Update 2: The original download included debug symbols and thus was quite big. The download now has 287MB. This post has all the details.